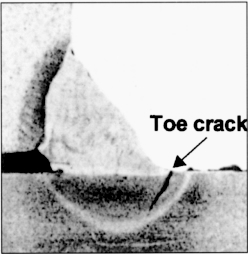 A cold crack is generally referred to as a spontaneous crack that occurs at temperatures blow 200°C after solidification is complete in welding. Cold cracking can develop hours or days after the weld has been made, which is referred to as "delayed cracking." Cold cracking is likely to occur in all ferritic and martensitic steels such as carbon steel, low alloy steel and high alloy steel unless adequate precautions, mainly preheating, are employed. 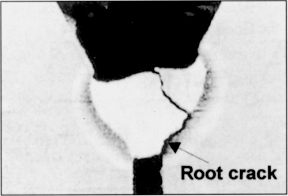 Cold cracks, as shown in Photos 1 and 2, are caused by the combined effects of low ductility of the weld, residual stress and diffusible hydrogen in the weld. A weld's ductility may decrease with a high carbon equivalent and a high cooling speed after solidification.Residual stress in a weld can be larger than expected if it contains weld discontinuities such as incomplete fusion, incomplete joint penetration, overlap, undercut, slag inclusions, and porosity. The source of diffusible hydrogen in a weld is mainly moisture in the welding consumable and atmosphere. (1) Preheat the base metal to reduce the cooling speed of the weld. This prevents the embrittlement of the weld and removes dissolved hydrogen from the weld. (2) Prevent weld discontinuities to avoid stress concentration. (3) Use low-hydrogen type welding consumables to minimize diffusible hydrogen in the weld. On preheating, it is important to determine the temperature appropriate to the base metal and filler metal to be used. The appropriate temperature is generally determined for individual work by taking into account several factors such as chemical composition, restraint level (or plate thickness), the welding process, heat input, and the amount of diffusible hydrogen in the weld metal. Table 1 is a quick guidance to the proper preheating temperatures for different types of steels. Note: These temperatures are for general reference only. In welding heavy-thick pressure vessels, immediate postheating (e.g. 300°C x 30 min) is often applied on the weldment right after welding finished, while the weld maintains the preheat and interpass temperature. This is to ensure no delayed cracking when the vessel is cooled to room temperature for nondestructive examinations before postweld heat treatment (PWHT). The combined use of preheating and immediate postheating is effective to prevent cold cracks in the weld.